I love crabs. 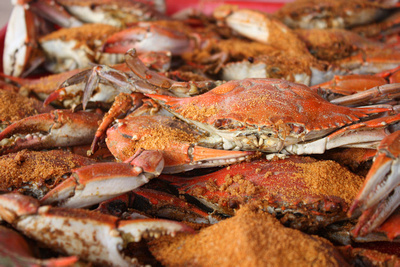 Crabs are my favorite sea food by far. We can't get them much because my mom is allergic. Crab cakes are good, but I like picking them and eating the meat. We eat normal cuts of steak about once a week. I like steak because it is really juicy and doesn't have much fat. My favorite cut is a filet. We only get them for Christmas dinner but they are so good. We eat this a lot in our family. We have it on a lot of holidays like Christmas and birthdays. One thing that is interesting is that my grandmother makes it with meat balls and my mom makes it with meat sauce. Also, we always have it with bread. We have made these before and they are amazing. I love wings. We usually have them at parties but sometimes we just make them because they are good. I really like guacamole and chips even though we don't ever make it. We usually get it at restaurants. I eat cereal a lot and fruity pebbles are really good.Cereal is usually my breakfast and it is one of my main foods. I like cereal because it takes no time to make.